Annie Hebden is stuck. Stuck in her boring job, with her irritating roommate, in a life, no thirty-five-year-old would want. But deep down, Annie is still mourning the terrible loss that tore a hole through the perfect existence she’d once taken for granted—and hiding away is safer than remembering what used to be. Until she meets the eccentric Polly Leonard. I have gotten a few gems from Harlequin lately. They are not romances. These books that I have read have been women’s fiction and they have been good women’s fiction. So, my perception of Harlequin has been changed for the better. I still like their romances but with the women’s fiction that they are putting out is so much better. Something Like Happy is one of those books. I went into reading this book thinking that it was going to be boring but boy was I wrong. The plot of Something Like Happy was very good and very sad at the same time. Annie and Polly hit it off from the beginning and I loved reading their interactions up until the end of the book. The idea of doing 100 Days of Happiness is intriguing also. I am actually considering doing my own 100 Days of Happiness myself. I want to see where it goes and how far I get. 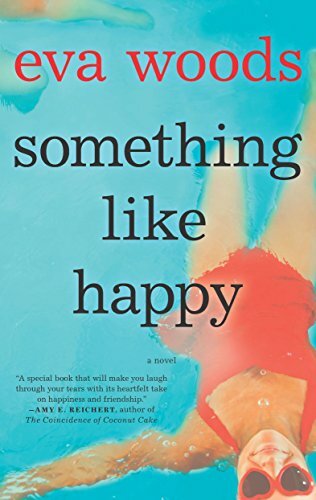 Something Like Happy fits into the women’s fiction like a glove. I would even go as far to say that it is chick lit. I usually do not read women’s fiction or chick lit but I have found myself being drawn to it lately. Annie was such a depressing character. She was not happy and it showed in her personality and her life. So when she met Polly at the Dr’s office, I was wondering how that friendship would affect her. It was uplifting to see Annie’s transformation from a bitter, unhappy person to someone who was full of life and forgiveness. She had some pretty ugly things happen to her. Polly forced her to face them and get over them, well, for the most part, get over them. She also forced Annie to go out of her comfort and do some pretty insane things. It was those things that made this book unbelievable!!! I loved Polly. From the minute Annie met her, you could tell that she was a character. Her outlook on life was something that I could only wish that I had. Her terminal illness only added more depth to her character. I also understood that she wanted to live the rest of her life to the fullest. Which she did with Annie’s help. There was a small romance between Annie and Dr. Max. That romance was so small that I thought it was only on Annie’s side…like unrequited love. If you want to find out what happens between Annie and Dr. Max, you need to read the book. The end of the book was both sad and hopeful. I cried for the last 3-4 chapters of the book. When I finished reading Something Like Happy, I had to sit for a while to reflect on what I read and the message that was throughout the book. Something Like Happy pulled at my heartstrings while I read it. I loved the message woven throughout the book as well. It is a beautifully written book that will make you cry and it will make you think. I would like to thank Eva Woods, Harlequin, Graydon House, and NetGalley for allowing me to read and review Something Like Happy.